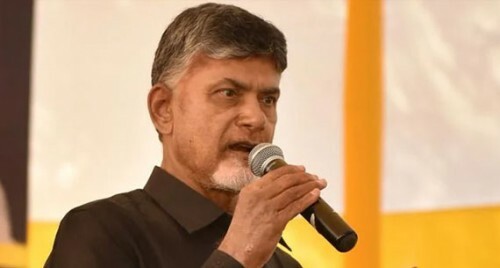 Amaravati, April 14 (IANS) The Telugu Desam Party (TDP) has defended sending technical advisor Hari Prasad Vemuru to the Election Commission (EC) along with Andhra Pradesh Chief Minister N. Chandrababu Naidu to discuss the issue related to the Electronic Voting Machines (EVMs), saying he was invited by the poll body in the past despite alleged involvement in a case of EVM theft. In its reply to the EC, the TDP alleged that instead of focusing on the issue, the poll panel was trying to avoid it. TDP's Rajya Sabha member and party's legal cell incharge K. Ravindra Kumar sent a letter to the EC after the latter issued a notice on Saturday to the ruling party questioning how Naidu allowed a person accused of stealing EVM to be part of the delegation that knocked on its doors. Maintaining that "such antecedents do not inspire confidence", the EC invited the TDP to send another expert "who does not have similar antecedents" to interact with the poll panel on Monday over the EVM issue. The notice to the legal cell of the TDP came after a delegation led by Naidu met the EC on Saturday to discuss poll-related issues, including those related to functioning of EVMs. The TDP expressed strong reservation about EC's approach towards its technology advisor on the ground that he was involved in alleged theft. An FIR in this case was filed at M.R.A. Marg police station in Mumbai in 2010. "To my knowledge no charge sheet has been filed in the above crime even after nine years," the MP wrote. The TDP also pointed out that Hari Prasad is first Indian to be honoured with EFF Pioneer Award 2010 by the Electronic Frontier Foundation (US). "As a security researcher in India, he had revealed security flaws in India's paperless electronic voting machines. In recognition of his pioneering contributions, Hari Prasad was conferred with such distinction. He published a research paper on vulnerability of Indian EVMs along with some internationally reputed co-authors from the US and the Netherlands," the TDP letter said. The party claimed that Hari Prasad's efforts were recognised and his suggestions were received positively by erstwhile chief election commissioners S.Y. Qureshi and V.S. Sampath and this led to design of VVPAT. The EC invited him to participate in the first field trial of VVPAT in 2011. The TDP said it was not the only instance when the EC invited and noted the suggestions given by him after so-called case against the whistleblower. "He attended the meeting as part of Chandrababu Naidu's delegation in capacity of technology advisor to Naidu. He presented a discrepancy in VVPAT machines before CEC and his team which is very serious in nature," it said. After his presentation, the Chief Election Commissioner (CEC) Sunil Arora invited him at 4 p.m. to meet D.T. Sahani, chairman of the technical expert committee formed by the EC to discuss further code discrepancy exposed by Hari Prasad but when he went there he was informed that the EC was not willing to discuss the issue with him due to criminal case against him. The TDP urged the CEC to continue good practice started by his predecessors S.Y. Qureshi and V.S. Sampath and direct the technical committee to comprehend, clarify and resolve the issues raised by Hari Prasad. The party said Hari Prasad with his experience in the subject may be called to meet Sahani and Deputy Election Commissioner Sudeep Jain, who is also in-charge of EVMs in the Commission.